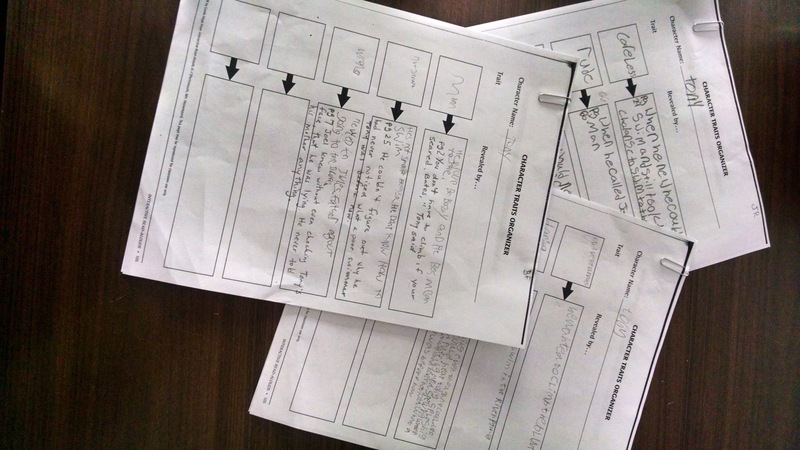 Sticking to one Topic: How can Writers Plan and Write a 1 Paragraph Response to a Question? Students will understand how to take a list of brainstorm “ideas” and separate them into categories. Students will understand that the “categories” indicate the “main idea” or “topic” of their paragraphs. Explain that writers stick to one topic in paragraphs and they plan it out. All good writers begin with a brainstorm. “Now we’re going to separate our lists into categories. Let’s look at the kind of items we listed for [name of list].” Read each list and separate the items into categories. If they have trouble coming up with categories for the lists you can guide them (for example, “Characters from the story” might have categories like: “gods,” “goddesses,” “heroes.” “Character traits of Achilles” might have categories like: “likeable traits,” and “unlikable traits.”) (5-10 mins). Explain how the separate categories each become a topic with details related to it. Practice individually with easy subjects like: “animals,” “items in [name a room of a house],” and/or “food.” Help them come up with categories and list the items that go within the categories. (10-15mins). “Now you’re going to try it with a subject we’ve been discussing. Get a piece of paper and write down ‘everything related to being a hero.’” Give them 2 mins. “Now read your list and find at least 2 categories.” If they have trouble you can guide them with ideas like “physical traits,” “personality traits,” and/or “deeds.” “Separate your items into your 2 categories.” (5-10 mins). Materials: writing implements and paper. Prepare ahead of time: words on post it notes for students to physically move into categories that they have named—give each student 10-15 words, each on a separate post-it, but related to a specific subject which can be broken down into at least 2 categories. Use words relating to subjects such as: hobbies, animals, foods, movies, rap songs, car parts…or others. Put the post-its randomly on a large piece of construction paper (each student will get 1 large piece of construction paper with 10-15 post-its on it). Also prepare ahead of time: a worksheet with several items listed so students can practice naming categories. This sheet will also be used for writing topic sentences. Warm-up (together): “Let’s list everything we can think of relating to the Greek gods and goddesses.” (take 1 min to list—each student makes their own list). “Make 2 categories for the list you just made.” If students need guidance, give them some suggestions such as—“goddesses,” “gods,” “their domains,” “their symbols.” (5-10 mins). Read and share. “Now I’m going to give you each a bunch of words that have been grouped together. You are going to figure out the categories. Read the post-its and then move them into your 2 or 3 categories.” (5-10 mins). When this activity is done, have students each read their category title and then list the items they moved into that category. (5-10 mins). Each student should have at least 2 categories with 5-8 items in each. On an overhead—quick review: list several countries then have students give you the name of the category; list several snack foods and have students give you the category; list several brands of shoes and have students give you the category. (5 mins). Lists of items to make into a worksheet (they will come up with the category name and during another part of the lesson write the category name into a sentence). Materials: writing implements, examples projected or where the group can see them with copies for each student with sentences relating to The Iliad and/or current vocabulary. Individual worksheets as required with sentences (to be turned to keywords). Worksheet from lesson 2. Additional worksheet with lists of details to expand into keywords. Explain that outlining what we write or taking notes can be faster if we use just keywords from a sentence. We take the important words only. Practice together with projected examples. After a few examples, students should be able to tell you which words to use and continue working together for practice. (5-10 mins). Give them a different sheet for them to do for individual practice. (5-10 mins). Explain: when preparing your details for writing, you have to expand them a little bit so you know what you want to say about them. Take out the worksheet from lesson 2 and look at the first list of words (pencil, paper, eye contact, directions). Write those down on a separate piece of paper. “We know that the category is ‘things needed for schoolwork.’ Let’s expand these details a little bit.” Ask them “what about the pencil?” etc… or “why do we need [name of item]”? Write down what they say—then turn it into key words. Example: They may say “you need a pencil to do the writing.” Write the sentence. Turn it to key words: pencil/writing. When you’ve done this task you should have a detail list in keywords for each of the groups of words from the worksheet. Doing 1 or 2 more together should reinforce the pattern: say the sentence, write the sentence, turn it to keywords. They can finish the sheet on their own. (10-15 mins). Have another sheet handy for additional practice if needed. (10-15 mins). Hector and Paris were brothers in ancient Troy. Paris was banished as a baby because he was going to be the downfall of Troy. Paris was secretly brought up by a shepherd instead of being killed. Paris returned to Troy and a joyous reunion from his family. Paris fell in love with Helen and brought her back to Troy. Helen left her husband Menelaus and the city of Sparta to be with Paris. Menelaus gathered the Greek troops and sailed for war with Troy. The war lasted ten years and many Greeks and Trojans died. Helen never really loved Menelaus if she left him so easily for Paris. The Greeks tricked the Trojans so they thought the Greeks had gone. The Trojans celebrated by bringing the Trojan Horse into the city. They didn’t know the horse actually had 25 Greeks inside ready to let the rest of the fleet into the city. Achilles was seething with Agamemnon and refused to fight anymore. Achilles wanted vengeance after his friend Patroclus was killed by Hector. Topic sentence: Each god or goddess chose a side to help during the Trojan war and aided that side in any way they could. Topic sentence: Achilles’ decision at end of the war had a big impact during the last year of fighting. Topic sentence: At one point during the last year of fighting, everyone thinks the war will end with a simple duel between Paris and Menelaus. Topic sentence: The Greeks are losing the war, so Achilles makes a decision which will change his life and the outcome of the war. Students will break down writing into small steps when given questions to answer in paragraph form: brainstorming, categorizing, detailing in keywords and writing a topic sentence. Materials: questions (general—for practice together, and relating to The Iliad for individual work). Examples prepared ahead of time with quick reviews: sentences to keywords, keywords to sentences, category names to topic sentences. Sentence Review: Yesterday, I went to the store and bought milk. Tomorrow I need to go to the dentist. Wednesday is the middle day of the week. (or similar sentences). Keywords Review: Burlington/city/Vermont; Iliad/story/war/love; Zeus/king/angry/lightening. Topic Sentences Review: things in a kitchen drawer; reasons to fight a war; ways to say No to someone. “Let’s practice answering questions using our new brainstorming and keyword strategies.” Give the question: Write a paragraph that discusses different hobbies people enjoy and why they enjoy them. “This is a question a teacher might expect you to write a paragraph about.” Explain how to break down the task into steps using the strategies we’ve practiced. Step 1 should be to brainstorm the hobbies you know and why people enjoy them. Step 2 should be to narrow the topic by making categories and sorting the list. Step 3 should be to turn the details into keywords. Step 4 should be to write a topic sentence for the details. They may come up with something like: photography/artistic; snowboarding/active/exciting; gaming/relaxing; reading/relaxing/enjoyable. With a topic sentence like: People usually choose hobbies that suit their needs. Questions for individual work: 1. Discuss your reasons supporting whether or not Achilles is a hero. 2. Is Paris a hero? Why or why not. 3. How would the story have been different if Patroclus had not died? 4. What would have been different if Hector had not been killed? Materials: handout with concluding sentence ideas, quick outline handout, quick review, prepared concluding sentence topics (on overhead/worksheets). Quick review, group activity: putting sentences into keywords/writing keywords into sentences. Use the following (prepared ahead of time on an overhead) Helen/Paris/love/war; Hector/Achilles/duel/death; King Priam bravely went into the Greek camp to ransom his son’s body. Achilles was shot in the heel with an arrow which killed him. (5 mins). Discuss the format for the brainstorming: it is called a quick outline. Show them how to fill in the quick outline sheet using the details and topic sentences they have already written from lesson 4. Fill out 4 quick outlines (one for each question). Point out that the “C.S.” line is still not filled in because we are about to learn how to do that. Hand out the “Concluding Sentences” sheet you prepared with the 4 types of concluding sentences. Read, discuss relationship of T.S and C.S. Practice with prepared topics together. (10-15 mins). Make a sheet of prepared topic sentences or just write them on an overhead—together come up with and write 4 possible concluding sentences for each TS on an overhead sheet. Use these topic sentences for practice: There are many ways to spend a weekend day. Sometimes directions people give are unclear. The Trojan War was a long and useless war. Each student should write 3 or 4 different concluding sentences for their Iliad questions begun in lesson 4—then they should choose the one they like best and write it on their quick outlines. (15 mins). These outlines will be used in lesson 6. Materials: prepared ahead of time—4 paragraphs that have topic sentences, details and concluding sentences; quick outlines of Iliad questions (begun in lesson 4 and finished in lesson 5). 3 paragraphs that have topic sentences, details and concluding sentences—but which have been written out of order. 2-3 sample quick outlines. As a group put the first of the 4 paragraphs into QO format, then have students individually put the other 3 into QO format on their own. (15 mins). As a group, look at the first sample quick outline and write it into a paragraph. Emphasize how the topic sentence is already there, putting each detail into sentences is just like what we practiced with keywords to sentences, then the concluding sentence is already there. Practice with another group one if necessary and do the last one individually or have them practice with the last 2 on their own. Students should then be able to write their QO’s from their Iliad questions into 4 separate paragraphs. Monday is an unpopular day of the week. People look at Monday on the calendar and realize that they still have 4 more days to go through until they get to the weekend. On Monday mornings, people sometimes have trouble getting up because they are used to “sleeping in” on Saturday and Sunday mornings. In popular culture, Mondays have often been associated with bad feelings and loud groans. If people could sleep through Mondays altogether, they might be able to avoid all those bad feelings. There are many animals that are endangered due to human activity. Many species of whales were hunted nearly to extinction in the last century and now they are having trouble recovering. Pandas are losing their natural habitat in the bamboo forests of China because of humans using the land for their own purposes. Polar bears have less ice to live and hunt on because of the warming oceans and climate change due to human activity. Humans need to change their ways if animals and humans are to live together in harmony. Summer is a favorite time of the year for many people. Because it is so warm, people are outside more and enjoying the weather. There are many things to do in the summer that can’t be done in the winter. Students are on vacation and can spend their days doing things they enjoy. Summer is an amazing time of year. Reading is an important, yet rewarding skill to master. There is a ton of information that can be obtained from the pages of a book, so knowing how to understand the information is important. When people read for fun, they are “transported” to a whole world where they can escape reality for awhile. When someone reads well, then lots of things are easier for them to master. Everyone should have the opportunity to learn to read better. TS: There are many things to enjoy at the fair. CS: At the fair, there is something for everyone to do and enjoy. TS: There are several Greek gods and goddesses who the ancient Greeks attributed to parts of the Trojan War and its outcome. CS: If the ancient Greeks and Trojans blamed all their fortunes or misfortunes on gods and goddesses, then they didn’t need to take responsibility for their own actions. TS: There are several legends, all involving one man, that are said to have caused the famous Trojan War. CS: There were many accounts told by the ancient Greeks that supposedly led to the Trojan War, but no single person could ever be responsible for such a tragic chain of events. Rabies is a dangerous disease, but it is relatively rare. Only 1 or 2 people in the US develop rabies every year, but thousands are exposed. Stay safe by never handling wild animals or petting neighborhood animals whose owners you don’t know. Rabid animals are rare, but if you are bitten seek medical attention immediately. When you know more about the risks, you can prevent yourself from ever getting Rabies. The last thing anyone expected to see in the middle of a road was a seal pup. But, there it was, eight miles from its ocean habitat in the North Irish Sea. Luckily, the seal pup was healthy and unharmed, so it was released back into its habitat. The mystery remains unsolved as to how it got so far away from its home. At least the story has a happy ending. Washington pygmy rabbits are some very lucky bunnies. These pocket-sized rabbits were hopping toward extinction just a few years ago. Wildfires and farming in Washington State had destroyed most of their habitat. Wildlife experts started breeding them in captivity. Now the pygmy rabbits are protected and are bouncing back. Vocabulary development is something I often go back and forth about—from thinking it’s very important, to thinking it’s only relatively important. On the scale of what I do when I teach, formal vocabulary work is often toward the bottom; but I’m working with students who have achieved fairly little success in school, added to their difficulties with language to begin with. My students often come lacking even with the ability to formulate paragraphs, though most can do sentences accurately. Many come from homes where reading was not just unimportant, but also ignored in favor of TV, disorder, and conflict. I see a great need for vocabulary to be increased because of the increased demand on literary understanding—though, realistically, they aren’t going to be seeing or probably using “vocabulary words” outside of school. I think that a component of vocabulary development, at least for teachers, is to know your goals for the vocabulary words. I know that my students generally aren’t college bound. To get them to graduate from high school (and often they are the first in their family to graduate) is what I’m helping them with. So vocabulary work that I do with them is on words I know they are probably going to hear or see in the news or in court or in a future job. I know many of them are not going to be above grade level on standardized tests—I know that even getting them to grade level is going to be a significant challenge since many of them, even though they are in high school, read at the 3rd to 4th grade level. Having a student who reads outside of school as a hobby and who has a large vocabulary is fairly rare, but I do have them occasionally. They are the ones who usually become the role models for the vocab work and can help the others learn the words faster. What I know about vocab work is not to have students “look it up, write the definition and use it in a sentence.” That’s boring and not useful, especially for students with learning disabilities and reading comprehension issues and behavioral issues. One of the most useful things I do with my students is have them relate a new word to something familiar to them—however odd it might be; some of them used the idea of “police coming over” as what would make them remember the word seethe. Words need to be “owned” by the students if they are ever going to really know and use them. In my class, we create a big chart of words that we are learning and we can move them around and group them by adjectives, verbs etc… Or we can group them according to characters we are studying—which ones go with which characters or actions from a story. They also use the words to create lists of related things in their own lives. 2 students practice a paragraph writing process for reluctant writers. My middle school writing class has students who are not strong writers. In fact, they often refuse to write. It’s been a two week process, but I’ve finally gotten them to write a basic five-sentence paragraph. Too often they get stuck when they are expected to write because they don’t know how to begin; they think they should just be able to write. This often leads to behavior problems since not being able to do something can trigger emotional trauma. Now we have finally gotten to the point where the students brainstorm, outline, and then write. The process that I’ve taught them is not something I came up with on my own. I have to give credit to the Stern Center for Language and Learning because that’s where I learned about this process through a course taught by Juliet King where she used the book Writing Skills by Diana Hanbury King to help us present writing in a new way to students with disabilities. I’ve adjusted the technique since using it for a few years, but I find it to be a great way to teach reluctant writers how to organize and plan writing that can be used to respond to a short-answer question. This process is short and concrete. First students will brainstorm everything they know about a topic or question. For example, today, my students did a character study about a character from the book On My Honor. They all completed a sheet that included character traits and then specific examples from the story to support those traits. 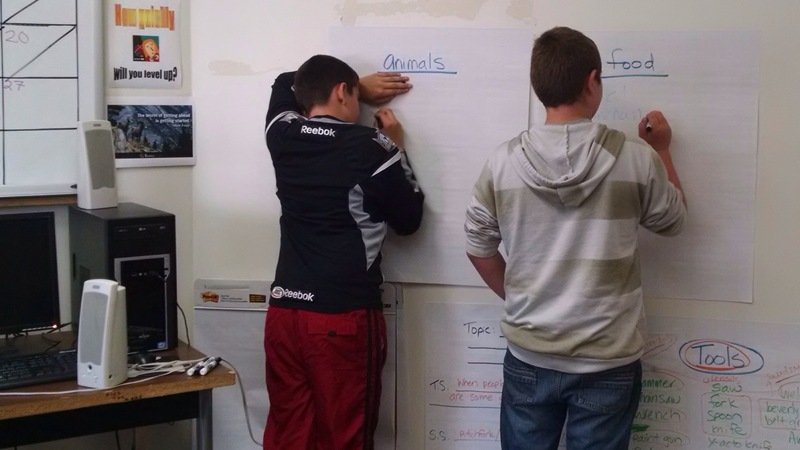 Once students complete the brainstorm they will do a simple outline. The outline contains the topic sentence, three supporting details (written in note form), and then the concluding sentence. After completing an outline, students write or type the final paragraph by using that outline. I’ve found this approach to be easy to remember and something that provides structure and organization for students who have great difficulty with that. The process of teaching them to use this format for writing meant that first I had to instruct them about how to brainstorm. Then I showed them how to categorize their brainstorm and organize it into more specific topics. Next, we learned how to write a strong topic sentence and to use the brainstorm to help write the supporting details. I also had to teach them how to put thoughts and ideas into a note form in order to get the main concepts of a sentence onto an outline without having to write out the whole sentence. Finally I taught them how to write a good concluding sentence. I had students practice this process verbally with lots of modelling from me before I had them move into writing on their own. As students get better at writing, the simple paragraphs can be expanded with more details and supporting thoughts. They also can use the concluding sentence as a way to transition to the next paragraph when writing multiple-paragraph answers. Over the years I’ve found that it is important to help students who have problems with organization put things into an ordered process because it helps them learn it and remember it better. It also provides structure and support which makes them feel successful and helps them reach their academic goals.